Hawes and Curtis review 2018 - unique detailed size information. Looking for a Hawes and Curtis review or a Hawes and Curtis shirt fit guide with actual garment measurements? This page contains information on Hawes and Curtis shirts, including the cuts available and unique detailed garment measurements only available on this site. You can purchase their shirts direct by clicking on the image below. Classic Fit shirts are Hawes and Curtis’ widest cut around the chest and waist. Relaxed Slim Fit falls between the Classic Fit and the Fitted Slim Fit. Fitted Slim Fit shirts are the narrower than Tailored around the chest and waist. Extra Slim Fit are the narrowest in the range. These were launched in 2013 and are part of the general trend in the industry towards slimmer, fitting shirts. In Spring 2018 Hawes and Curtis updated their shirt sizing and range and I’ve updated this page to take account of that. For the chest the shirt circumference should be six inches larger than the body measurement for a comfortable fit. Four inches for a tighter fit. For the waist the shirt circumference should be four inches larger than the body measurement for a comfortable fit. Three inches for a tighter fit. All shirt manufacturers I know of insert an interlining into the cuffs and collars of their shirts to make them more robust. Hawes and Curtis, like many others, use semi-fused interlinings, which means that their collars and cuffs have an interlining which is fused with the material of the shirt. As part of the Hawes and Curtis review I took one of their shirts apart. The image shows the fused interlining, (1). 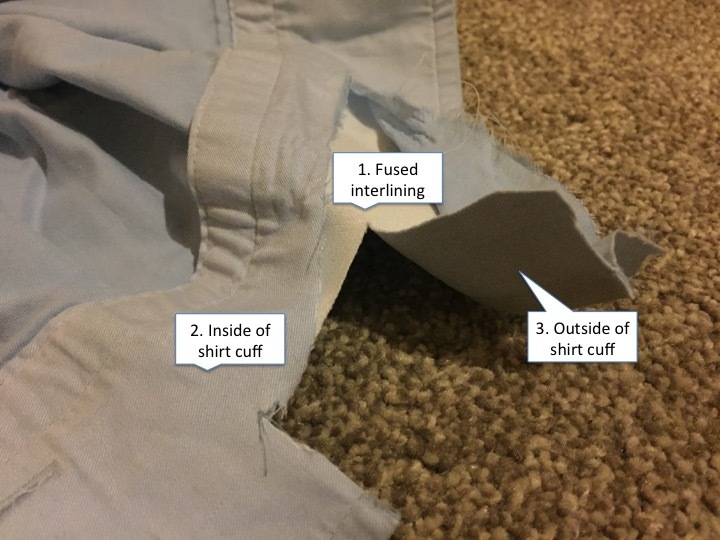 The interlining is separate from the material on the inside of the cuff (2) and fused to the outside (3) of the shirt cuff. This is called semi-fused as the interlining is only fused to the outside. If the interlining was fused to the outside and inside it would be called fully fused. The image below shows the collar of the same Hawes and Curtis shirt. 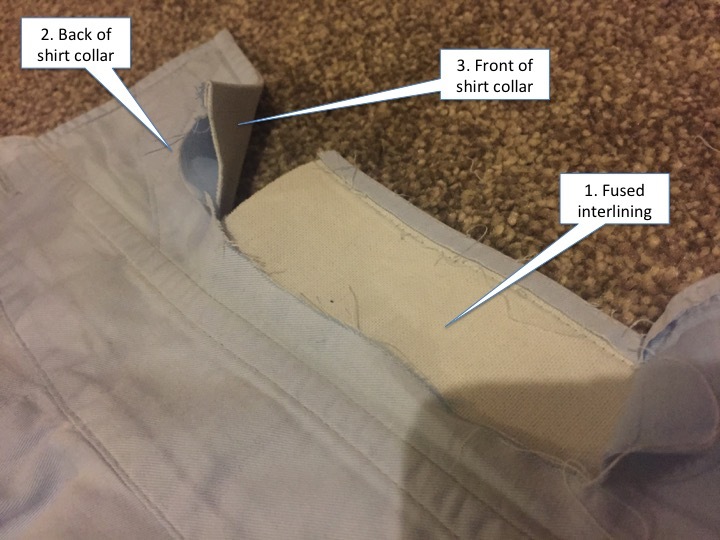 The same construction technique is used: the interlining (1) is separated from and not fused with the back (2), but is fused to the front (3) of the collar. In the tables below N/A means this particular cut was not available from Hawes and Curtis. Compared to Charles Tyrwhitt and TM Lewin, Hawes and Curtis use fewer discount codes. The latest information I have on their discount codes is here. As part of this Hawes and Curtis review I’ve looked carefully at the Hawes and Curtis shirts I bought recently but there is no information on where they are made. I have been told the shirts are made in Turkey. Shirts that fit like Hawes and Curtis shirts? Shirts that fit like the Hawes and Curtis Extra Slim Fit? Try the Charles Tyrwhitt Super Slim Fit. Although the Charles Tyrwhitt Extra Slim Fit has a much smaller range than Hawes and Curtis. Shirts that fit like the Hawes and Curtis Fitted Slim Fit? Try the TM Lewin Fitted Fit or the Brooks Brothers Milano Fit. Shirts that fit like the Hawes and Curtis Classic Fit? Try the the Eton Shirts Classic Fit. Can’t find what you’re looking for in this Hawes and Curtis review? Try the shirt search engine to find a shirt that fits you.